This medieval castle stands in the centre of the village of Skenfrith and is on the banks of the River Monnow. It was built beside the River to command one of the main routes between England and Wales. The first defences were built just after the Norman Conquest of 1066, although much of the remains left standing today, the circular keep and the curtain wall with towers, date from the early 13th Century. It is one of three castles built in the valley as part of the Norman Conquest of South Wales, the other two being Grosmont Castle and White Castle. The Monnow Valley was an important route between Hereford and Monmouth in medieval times, due to its position as an area of relatively open land, which provided a break between the river cliffs of the Wye Valley to the south, and the hills around Abergavenny to the west. The castles known as the 'Three Castles' which are Grosmont, White and this one, are usually grouped together by historians because for almost their entire history they were part of a block of territory under the control of a single lordship, the Earl of Hereford, and for part of the early 13th century under the control of Hubert de Burgh. All three castles passed back and forth amongst the Kings, their families and via Edward I's younger brother the Earl of Lancaster became part of the Duchy of Lancaster in 1364 in whose care their remained until 1825 when the castles were sold to the Duke of Beaufort whose estate divided them and sold each to different local landowners in 1902. White Castle was given to the state in 1922, Grosmont in 1923 and Skenfrith passed through several hands before being given to the National Trust. All three are now maintained by CADW. The remains of what is seen today dates mainly from the period it was in the hands of Hubert de Burgh who totally rebuilt the castle between 1212-1223. Excavation has shown that the castle sits on an artificial gravel platform, up to 12 feet thick, and therefore originally had a defensive ditch. Huberts construction included a round keep with three floors surrounded by a curtain wall with a round tower at each corner. Around this was a 20 feet deep paved moat, like that at White Castle, with it's water being taken from the River Monnow which runs alongside it and this in turn would have fed a mill to the south. The castle entrance was in the northern wall, today there is just a gap. The curtain walls have thicker bases than along the top for extra defence. Each corner tower was built with a solid circular basement, accessed by a wooden ladder, and they would have been entered from the first floor via a wooden staircase. There are no windows, just arrowslits suggesting they were only used for defence purposes and not lived in. Within the bailey there was a two-storey hall block running along the inside of the western wall. The ground level was filled in with gravel in the 13th or 14th century, and at the same time the level of the castle’s interior was raised to combat winter flooding. A later room was added along the northern wall, forming these buildings into an ‘L’ shaped block. The upper floor had three rooms, and the fireplaces and stonework suggests domestic apartments, and possibly a Great Hall. On the southern end of this block of buildings was a square tank which was the castle reservoir. Between the south-east tower and the water gate, it is thought the kitchens were situated. The circular tower-keep in the middle of the inner bailey and dominating the rectangular ward, was probably the main residence with the upper two floors containing apartments. A turret at the western side of the keep would have held a spiral staircase that gave access to the upper levels. This is thought to have been constructed between 1219 and 1232. Visiting today the castle is surrounded by a grassy lawn in the centre of the village. The moat has been filled in but the River Monnow still runs along beside it. Three of the four corner towers still stand as well as the curtain wall up to the level of the wall walk. The round keep is intact, and the foundations of the hall block along the western wall have been excavated as well. 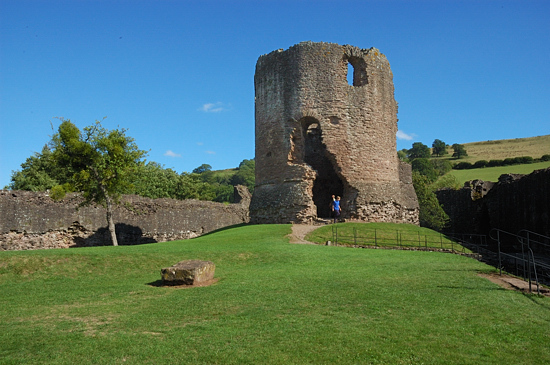 Note: Along with White Castle and Grosmont Castle, this trio are known as the Trilateral Castles built in the Monnow Valley and they are all part of the Three Castles Trail/Walk, a waymarked long distance circular footpath covering 19 miles. 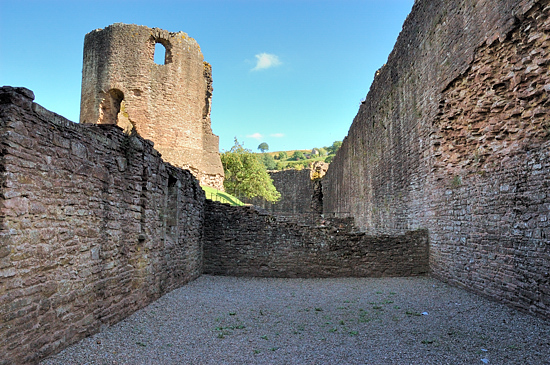 The route links Skenfrith Castle, Grosmont Castle and White Castle. It follows woods and hills and takes you over Graig Syfyrddin (Edmunds Tump) from where there are views of the Welsh Marches, the mountains of South Wales, including the Black Mountains, Wales and the Forest of Dean and beyond. 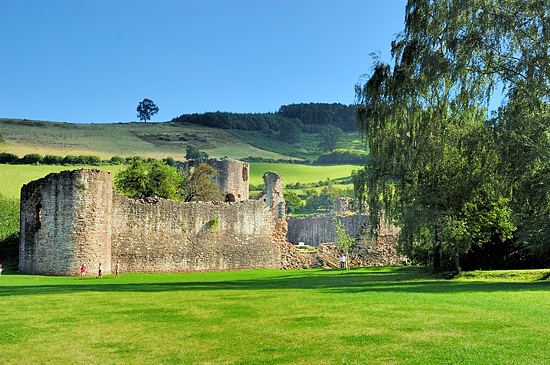 The Three Castles Walk links with both the Offa's Dyke Path, National Trail, (at White Castle) and the Monnow Valley Walk (at Skenfrith and Grosmont). Getting there: From Abergavenny B4521 to Skenfrith; from Monmouth, B4347 then B4521 to Skenfrith. Access: Parking allowed on the road opposite the castle. There is one small flight of stairs to the inner ward. Opening Times: Open unstaffed site, access at all reasonable times usually between 10am and 4pm. Notes: No public toilets at this site. There are picnic tables around the outside of the castle and on a summer's afternoon next to the river makes an ideal summer picnic spot.